New bone china patterns and items added to our assortment. We are updating our bone china assortments to reflect new patterns and items. Each time you purchase your favorite tea, try a new tea, or shop for something special, points will be recorded for every purchase. Please click reward yourself for details..
All Roy Kirkham Lancaster and Louise style mugs, as well as the breakfast cup and saucers have a price reduction. Now is the time to treat yourself while prices are low. New French Presses- New styles, designs and colors. Sale Items- All new clearance and sale items. Holiday Items - Great seasonal gifts and home decor. Brewing AccessoriesVariety of brewing accessories, Tea Balls, Infusers and Tea Sacs for your tea brewing needs. 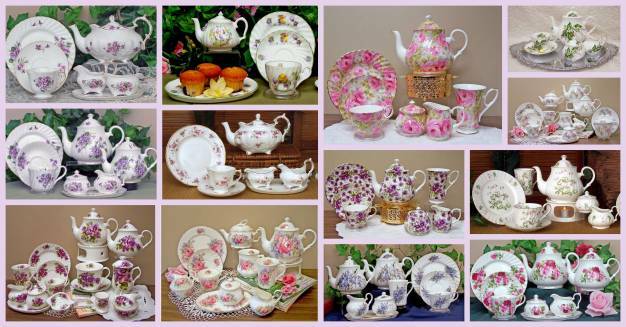 Berta Headstrom China We have imported a great selection of English bone china to bring you some of the traditional patterns and styles from England. Picnic Baskets and AccessoriesOver two decades ago Picnic at Ascot introduced the British tradition of stylish, high quality picnic baskets to the US.